Slique Bars are a medley of exotic fruits, nuts, and science creates the perfect functional, nutritious snack to help you feel fuller, longer. 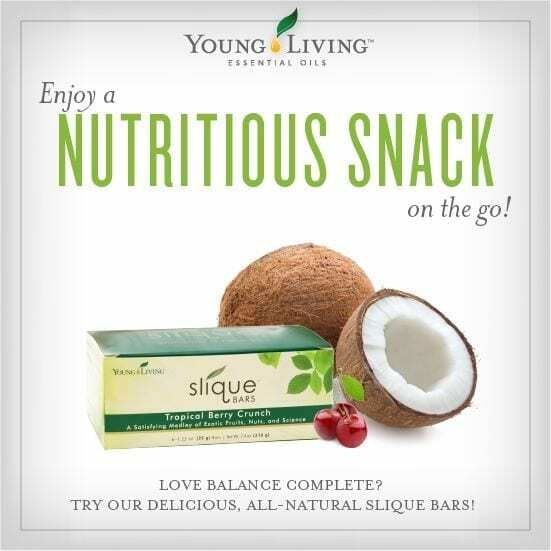 Slique Bars also deliver essential nutrients and antioxidants through the addition of pure cinnamon, vanilla, and orange essential oils; a dried-fruit blend featuring golden berries and wolfberries; and D. Gary Young’s exclusive dehydrated cacao nibs. Slique Bars’ dual-targeted satiety approach and medley of exotic fruits, nuts, and science creates the perfect stimulant-free, nutritious snack to help you feel fuller longer. Each box contains six bars (35 g each). Consume before or between meals with 12 ounces of water to help control hunger. Individuals who may be sensitive to high-fiber diets should exercise care when consuming more than 2 bars daily. Storage: Keep in a cool, dark place. A mix of exotic nuts and berries, featuring baru nuts, golden berries, and wolfberries, delivers delicious taste and promotes fullness when combined with protein and high levels of fiber.